Energy Casino does not accept customers from USA. Check out which online casinos would be happy to have clients from USA. This indicator depends on the variety of ways which Energy Casino offers his clients to contact customer support and the speed with which it solves a problem, as also the overall customer experience. The reputation rating of Energy Casino is based on its popularity in online space - comments, user ratings on other sites, and social networking likes. 50% up to €200! 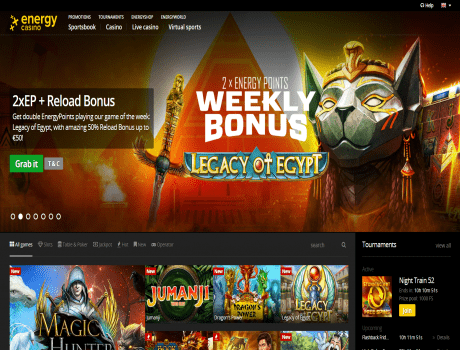 Make a second deposit and you will get up to €200 extra from EnergyCasino. The offer is valid after you claim your Welcome Bonus. At EnergyCasino, we like to celebrate each and every new player, so they will match your first deposit with a 100% Bonus, up to a hefty €600. Just make a deposit ensuring that you select the ‘Welcome Bonus’ option, and your 100% Bonus will be added to your account.